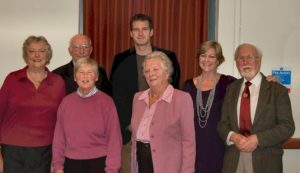 We were indeed fortunate to have the historian Dan Snow as our speaker at the 60th Anniversary Meeting of the Society when an audience of almost 150 was treated to a most interesting and thoughtful presentation entitled ‘Adventures in Television History’. 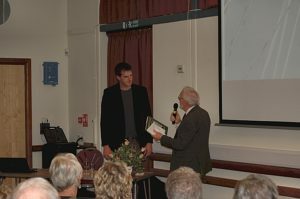 In introducing his subject Dan emphasised the cultural importance of history and its endless fascination. He said that one vital role of history is its ability to provide context for the present and in so doing give clues in respect of future ways forward. He bemoaned the fact of how little this guiding principle was recognised and adopted. He suggested a current example was the way in which political leaders and economists were struggling to find precedents for the present global financial crisis. Dan continued by showing how views of history were varied depending upon factors such as one’s country of birth. A point he illustrated by describing, whilst visiting Russia, how some of those he spoke to were unaware that Great Britain was also at war with Nazi Germany! Dan continued his talk by underlining his continued and growing interest in the subject through the various television series including the History of the Royal Navy and Battlefields. Dan kindly agreed to answer questions and there was a lively response from an audience that was plainly enthralled by such a stimulating evening. The vote of thanks was given by the President, Jude James, who also presented on behalf of the Society a copy of his history of Lymington. 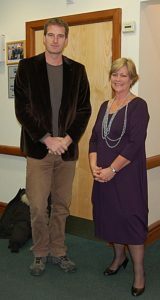 The talk was heartily applauded and it was very much an evening to remember. The next meeting of the Society is on 27th January 2012 when the speaker will be Colin Van Geffin whose subject will be ‘Ships of the Sky’, dealing with the history of flying boats in Southampton.